I am a big fan of quick and easy meals, specially during the week. Although it takes approximately an hour to bake the sweet potatoes, it gives you enough time to get everything else ready and maybe even squeeze in a 30 minute feet up with a glass of vino. Place the sweet potatoes in an ovenproof dish or on a lined baking sheet with parchment paper and bake for 60 minutes. Depending on the size of your sweet potatoes you may need to adjust the bake time. When a knife goes through to the centre without resistance, it is ready. While the sweet potatoes are baking, drizzle olive oil in a pan on medium heat. Season the chicken breasts with salt and pepper and fry until the first side is a light golden brown, flip over. Add the chicken stock, cover the pan and cook for an additional 10 minutes or until the chicken is cooked through. Remove the chicken from pan and shred with two forks. Whilst you are doing this, you might want to reduce the amount of chicken stock in the pan. You really want no more than about ¼ cup. Add the shredded chicken back into the pan, mix with the stock and then add the BBQ sauce and mix through again. 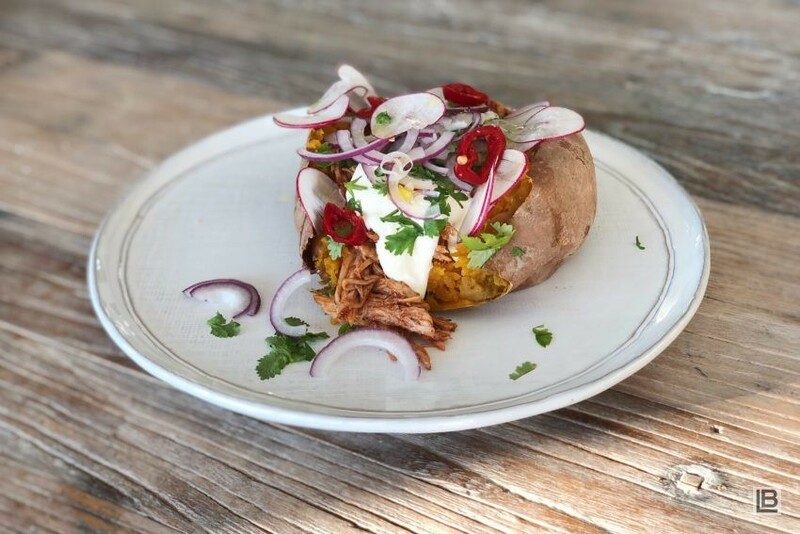 Slice each sweet potato in half, fill with BBQ chicken, top with creme fraiche/sour cream, red onion, cilantro and sliced radish.